ARLINGTON, VA, February 11, 2016 – Today, PBS KIDS launched Daniel Tiger’s Stop & Go Potty app, developed in collaboration with The Fred Rogers Company and Schell Games. Stop & Go Potty encourages young children to practice bathroom routines at the potty and at the sink with help from beloved animated characters from the award-winning, Emmy-nominated PBS KIDS series DANIEL TIGER’S NEIGHBORHOOD. Inspired by potty-related stories from the series and the effective related musical strategies featured in these shows, such as the “Stop & Go Potty” strategy song, the new app helps children practice stopping their play when Daniel Tiger and his friend Katerina Kittycat have to go to the potty. 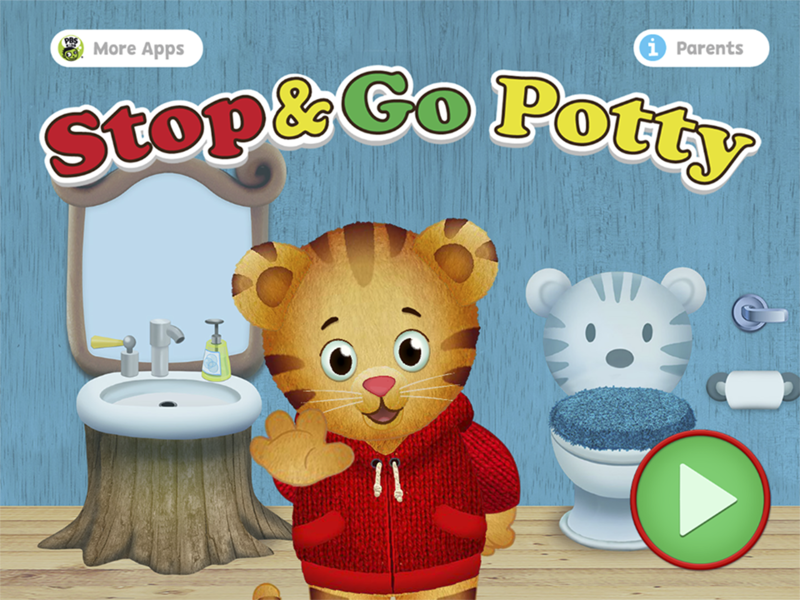 Daniel Tiger’s Stop & Go Potty app is available now on iPhone, iPad and iPod touch. Daniel Tiger’s Stop & Go Potty app is now available for $2.99 from the App Store, and coming soon to Google Play and Amazon. More information on PBS KIDS apps is available at pbskids.org/apps. The company was founded by Fred Rogers in 1971 as the non-profit producer of MISTER ROGERS’ NEIGHBORHOOD for PBS. In the years that followed, it not only created hundreds of episodes of this much-loved program, but also extended Fred’s values and approach to other efforts in promoting children’s social, emotional and behavioral health and supporting parents, caregivers, teachers and other professionals in their work with children. The Fred Rogers Company continues to build on Fred’s legacy in innovative ways through a wide variety of media, and engaging new generations of children and families with his timeless wisdom. The company’s highly rated, award-winning children’s series include DANIEL TIGER’S NEIGHBORHOOD, PEG + CAT and ODD SQUAD. For more information, visit www.fredrogers.org. Schell Games is a full-service game design and development company with a focus on creating transformational games and innovative, interactive experiences. Founded in 2002 by world-class game designer and renowned author Jesse Schell, the studio, based in Pittsburgh, PA, heralds a highly talented array of artists, programmers, producers and game designers. Schell Games specializes in creating memorable experiences through mobile, VR, PC, console, handheld, online and social games, interactive theme park attractions, connected toys and virtual worlds. The company counts some of the world’s most respected brands as clients, such as The Fred Rogers Company, Yale University, SeaWorld Parks and Entertainment, The Walt Disney Company and Microsoft Corporation. For more information on Schell Games, visit www.schellgames.com or contact us at info@schellgames.com.